Adventure Cove is home to two of the finest miniature golf courses anywhere. Each 18-hole course has a unique and challenging design. “Lost Lagoon” is a family favorite with meandering hills, large waterfalls and rich-green landscaping. 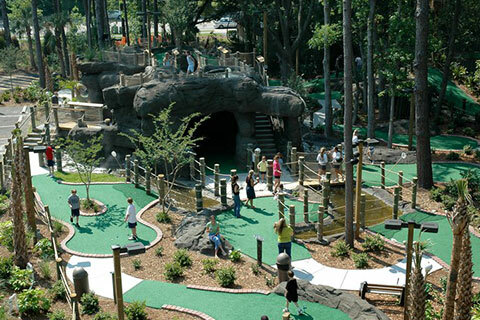 When you choose to stay with Vacation Homes of Hilton Head, you can enjoy mini golf at Adventure Cove for free with our Southern Hospitality Pass*. The fun doesn't stop there - we also offer exclusive perks like free Dolphin Cruises and Bike Rentals. 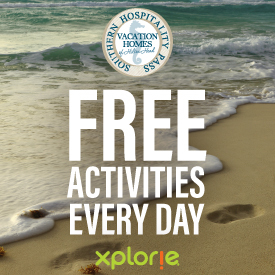 *Enjoy one free adult admission per unit, per paid night stay, with no reservation required. Noncumulative and nontransferable. Unused admissions expire daily. Planning your vacation should be as much fun as taking it - that's why we offer these resources to help make planning your Hilton Head vacation a breeze. From Singleton Beach to Burkes Beach and beyond, Hilton Head offers many beach communities to choose from. Learn about each community and decide which area will be best for you and your loved ones. Bringing pets? Looking for an oceanfront property? Our vacation home search allows you to find the perfect vacation home for your family by beach, amenity and more! From finding the best brunch spots to the top places for dining with patio seating, our guide to the best of Hilton Head has all the information you need to make your must-do trip list.